Crosscut saws had series of teeth arranged in a repeating pattern: 2 or 4 cutters (which alternately severed the grain on either side) followed by a raker which chiseled out the wood in between. Bow saws had a smaller version of the same thing. It was an art to file a saw. First the saw was "jointed"; using a special gauge the teeth were filed down until their lengths all matched. Then, using another gauge, the rakers were filed down slightly lower. Then the cutters were filed to a sharp point, and hammered against a block to alternately bend them right or left to give the saw its "set". (A saw must cut a wider kerf than its thickness or else it will stick.) Then the tips of the rakers were tapped with a hammer to bend the points down like little chisels, pointing in the right direction. Several different files were used, along with the gauges and a special hammer. And it took a lot of time. Most large outfits had at least two saws for every crew, and men who did nothing besides sharpen saws. The top photo is that of a Crosscut Saw, with the second photo being a 4 tooth bow saw. 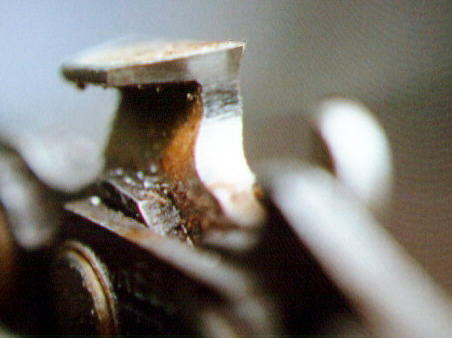 Note how this saw was designed so that unlike your common carpenters saw, it would saw in both directions. This provided work for the man on each end. The amount that was cut with each pass was not left to chance either. The 'rakers' (the narrow twin-pointed tooth) limited the depths of the cut. It was their job to clear the chips out of the way. While many have believed that the rakers controlled the depth of cut, this was not actually true. They only limit it. the depth of the cut in each pass is a function of the sharpness of the teeth and the pressure on the saw against the wood. The rakers do provide a practical limit on the depth of the cut because they will snag on uncut fibers if the saw is pushed so aggressively that they reach the bottom of the cut. For this reason aggressive fallers who preferred to get the job done in fewer hard strokes, would file down the rakers. Of course, then the rakers would not do the job for which they were intended unless the saw was used aggressively.
. Another difficult task for the saw filer was to get the saw filed evenly left and right. Since most people are either right handed or left handed (including the filers) they have to be careful not to file harder on the sides of the teeth that can be filed right handed as opposed to the left handed teeth. A saw that is misfiled won't cut straight.. When the chain saw was invented, the chain had cutters that tried to mimic the hand saws of the day. A lot of time was lost taking the chains off the saws and placing them in jigs and filing them. Then, in 1946, an Oregon Logger named Joseph Cox noticed a beetle larva eating its way through wood with its C-shaped cutters. He devised a chain that would cut the same way, and sold it as Cox Chipper Chain. It not only cut well (including some ability to cut back out of a kerf if the saw was getting pinched), but, more importantly, it could easily and quickly be sharpened in the woods, on the saw, with one round file, in a few minutes. This chain was the key to making the chain saw a success. Cox's company (now called Oregon) has improved the chain, making the cutter more square over the years, until now we have "chisel" chain. Looking at the bottom picture, you can see how the corner and side plate of the tooth do the work of the cutters on the crosscut saw, severing the grain, while the top plate chisels out the chips like the crosscut's rakers. (Saw chain has projections in front of each tooth that are sometimes erroneously called "rakers"; they are really "depth gauges" that control the bite each tooth takes; they cut no wood.) This chain can also be filed "square" (using a hexagonal file). That is somewhat harder to do than using a round file, but it results in the fastest cutting chain yet.